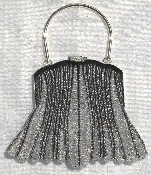 This rich purse should be out on the town!! Knit in contrasting colors and silvers for a flashy rich purse, or white on white for a wedding. This purse is beautiful in every color. Copyright © 2006-2019 Victorian Purses By Sue. All rights reserved.